Here is a gallery of Other Species of fish that we catch daily! The Delaware river is a fantastic fish habitat that can support many species of fish. 31" 15lb Channel Catfish caught on an ultra light rod with 4lb test line! A pod of stripers found 300 miles from the Ocean. A young Striper heading for the ocean. Winter time, fat Yellow Perch! A hefty Sucker fish caught on a mid winter float in 2017. Brandon battled this 10lb Carp for 15 minutes into the net! 30" Carp on this Rainy day! 32" tiger Muskellunge found and caught by Guide mike! 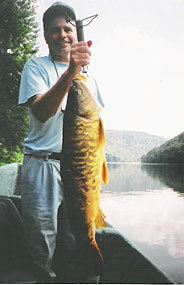 A 30" Carp took a Rapala back in 2006, wow!